My year of finding a New Me has been an interesting one. I started by investing in the French Chic Academy, and all I can say is, it's been a total game changer for me. 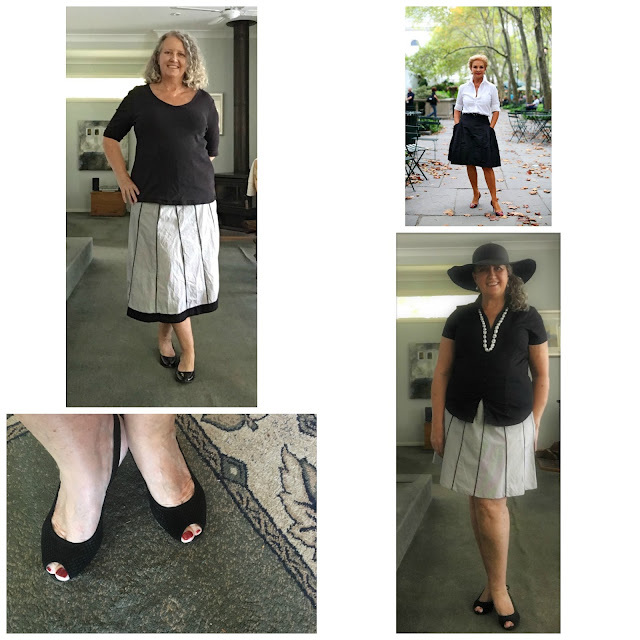 Seen above left, is a skirt I liked very much, worn at the start of the year, with a black t-shirt and patent ballet flats. I actually thought this looked okay, and it wasn't too awful. But using the very lovely Carolina Herrera (top right) as my inspiration, and the advice of Marie-Anne Lecouer of The French Chic Academy, I have found a more flattering length for this very same skirt, including peeptoe heels, a button down shirt, a hat and a strand of pearls to lend height and length. ...which I had previously felt entirely comfortable in. What I didn't see was that these items were totally unsuitable for my height and shape, and that I really wasn't doing myself any favours by continuing to wear them. I stopped shopping at the nearby upmarket thrift store. I was previously a weekly, if not twice weekly visitor, justifying my spend-ups by comforting myself with the idea that if I only wore the items once, it didn't matter. Meanwhile by wardrobe was bulging with clothing, and I still had 'nothing to wear'. The savings of $50+ per week, were channelled into paying for my French Chic Academy course, and investing in some genuine Baroque pearls, an item I'd longed for since my honeymoon twenty years ago. A sleek hat was procured for those days when I might require a little shade on my nose, which here, is most days. This was far more flattering than the tennis style visor I'd previously worn, and has served me well, from beach to lunch events for many months. Learning from Marie-Anne Lecouer and The French Chic Academy, I've become a student of 'what suits me'. Not what is fashionable, or what looks good on someone I pass in the street or see in a glossy brochure. Me. Just me. I've reassessed my ideas on what is 'dressy casual'. Previously the aforementioned shapeless shift had been a key item in my wardrobe. Again, not entirely terrible, but not fabulous either. Now it's more likely to be skirts and pearls and heels. I've learned that I really can wear a small heel most days, and it was more a case of getting out of the habit of wearing them, that made them uncomfortable. Little button down shirts have found their way into my wardrobe too, and I am enjoying showing off my silhouette, in preference to hiding it under swathes of fabric. My passion for black is slowly being tempered with quite a few items in Navy blue, and I am finding that yet again, Marie-annes advice is sound. It's softer and more flattering for certain. Those pearls have been one of the best purchases of my year. I try to wear them daily if I can, and feel wonderful no matter what I pair them with. and that even the cardigan over the shoulder, with pearls, is better sometimes exchanged for the cardigan worn properly with a longer glass bead necklace to add length to the torso. A subtle difference in the accessorising, but a dramatic one in the wearing! My latest purchase, having enjoyed success with my skirt and shirt combo, is this dress. Not something I would have looked at twice a year ago, but which now I am confident, I can carry off successfully. And likewise this one here as well. These both need a little tweaking and adjusting in length and neckline, but again, I've learned this year, that if the silhouette is right, I can adjust things like length, and width easily with my trusty sewing machine. For now, I am thrilled with the progress I've made. I continue to learn and grow, and am forever thankful for Marie-Anne Lecouers support. I truly am, A New Me. Love it Mimi! Gorgeous as always. I can totally relate to the denim capri pants. I've lost my way these last couple of years. Being in love took over who and what my style was. I need to get back to that. Surely I can be in love and stylish at the same time? Thanks for the inspiration! You look wonderful Mimi I will when I lose weight. Mimi I have told you of friends who saw me in pencil pants and a button down shirt wondering when I had lost all the weight. No I hadn't lost weight I was just more 'streamlined' as my friend described it. I am still wearing skirts and shirts but the shirts are now more fitted and shaped rather than sack like and floaty. I have also taken to wearing shoes and nice sandals rather than just thongs. Thanks to you I feel quite a lot better about myself and about my presentation. you look truly gorgeous, so beautiful and glad, your smile is filled with such a inner joy, thank you for sharing your sweetness !!! I've really enjoyed your wardrobe journey. You have provided us with plenty of ideas and great photos to demonstrate the effect. Personally I have hardly purchased a thing. I'm really analysing what I already have which, like you, is a wardrobe full of clothes but still struggling to find things to wear. I have successfully modified some things and done a bit more mixing and matching. I'm afraid once I pair a shirt with a shirt or pants then that's it, I rarely change the theme but I have discovered some better combinations by taking the time to experiment. I gave my jewellery drawer a good clean out and made up some long necklaces out of beads that I never wear by pulling them apart and restringing them. Hope you continue with the wardrobe advice next year. I think I take more notice when it comes from a real everyday person rather than a glossy magazine. This is such a fabulous post, Mimi! You are correct, your old looks were just fine but why be fine when you can be fantastic?! You definitely took it up a notch and you look absolutely amazing! I love your style! What a difference! You've really developed a lovely style of your own. Well done my dear! You look so nice! You have great style now! I love your hair too! I too have followed along with your journey and then started my own. I didn't join an online course, but I did begin to actively study my shape, what suited it, what felt good upon me and what made me feel fantastic. I have embraced my inner girlie girl at long last! Like you, I found I was instinctively doing some things right and some things were just wrong. I began to question why something appeared off and what I could do differently etc. Result was that this year, for the first time in nearly 23 years I bought a dress. A little black dress. A dress that is not shapeless nor a form clinging thing either. It hits me just at the knee where no dress ever seemed to hit me anywhere but at mid-calf in the past. I always looked and felt dumpy in those dresses hence why I stopped wearing them. This dress fits properly. I tried on another in Navy which I like a lot with my skin and hair tones but the shape was off and I didn't see how that could be adjusted without a complete renovation of the material into something else, while the black dress truly was flattering.